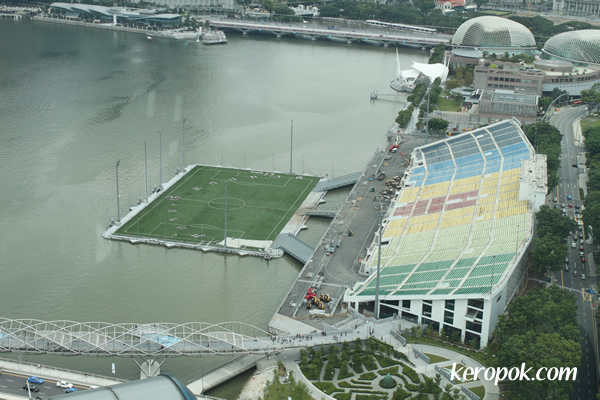 'Boring' Singapore City Photo: Floating Platform now a field, where has the cauldron gone to? Floating Platform now a field, where has the cauldron gone to? A view from the Singapore Flyer last weekend. The Marina Bay Floating Platform that was used for the Opening and Closing ceremony of the Youth Olympic Game is now a field again. I watched a show that says that the floating platform was certified to be a ship or something like that, but can't find the information anywhere online. I wonder if anyone has info on that. Just wondering, is anyone as curious as I am? Did they preserve the Olympic Cauldron? Is it moved somewhere to be preserved? Or it's dismantled and recycled? How cool. Did you watch the games?